Daddy Day Care – One man. One baby. One hundred and forty seven days. One man. One baby. One hundred and forty seven days. So Lady K’s first tooth started pushing through the gum the day before yesterday and she is not happy about it. Not happy at all. Oh, and she has a cold too, just to top things off. I’d been dreading this day since we had her, as I knew it was the beginning of months of potentially irritable baby and poor (worse?) sleep. Ironically, she has slept through every night (11+ hours) since this started and I’m not sure why; perhaps she’s just exhausted – I know we are. Even so, if she starts sleeping through we’ll all be happier I’m sure! Anyway, she’s standing up very confidently now and will happily lean with her back against the sofa and stand independently until she gets bored. Good progress, regardless of the teething. Welcome, my name is David and I’m (currently) a stay-at-home dad. 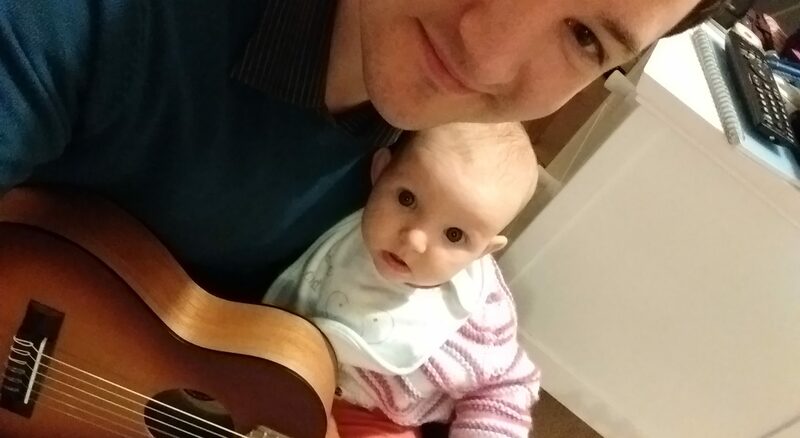 My wife went back to work when my daughter, let’s call her Lady K, was 6.5 months old and we traded my wife’s maternity leave for shared parental leave. I’ll be off looking after our little darling/monster for 5 months and I’ll share my story with you as it unfolds, you lucky people. Anyway, yesterday was like most Tuesdays: up and out for the 10am ‘stroller’s group’, a collection of about 20 mothers (and me) walking around our local town, blocking up the pavements and high street, followed by tea and cake. This is actually my favourite baby-related activity of the week, mainly because it actually involves a lot of adult interaction and it doesn’t involve sitting on the floor. All baby groups seem to involve sitting on the floor. Actually, the stroller’s group does have some floor-sitting, but that’s after the tea and cake, so I can excuse it. Today’s activity is baby sensory. For those of you unfamiliar with baby sensory, it mainly involves sitting on the floor with your baby in a big circle, singing them songs, attempting sign language and waving things at them – generally feeling a bit foolish. There are all kinds of activities for them: looking at a parachute covered in balloons, looking at lights on the ceiling, looking at something colourful in my hand – you get the gist. Anyway, Lady K generally likes to try and use me as her private ‘daddy climbing frame’ for the duration or crawl across the floor. To be honest that describes almost all of every day anyway, so essentially, I’m just doing the usual ‘Lady K containment’ in a slightly trippy environment. - Why won't she sleep (for me)? - What do you mean "time off"?